Cheshire reputedly boasts more millionaires than anywhere else in England, outside of London. But although Premiership footballers continue to strut their stuff in vast gated mansions in the north of the county-where a shortage of stock keeps the market on its toes-vendors of high-end country houses around popular villages such as Tarporley, Bunbury and Malpas in the rural south-west, have been feeling the pinch in recent years. But there are signs that the tide is beginning to turn, ventures Stephen Cheshire of Jackson- Stops & Staff in Chester. ‘Six years into the recession, there is a feeling that the country-house market has, at last, ‘bottomed out’, even if prices haven’t yet started to rise again,’ says Mr Cheshire, who has signed off on more country-house sales in the past few months, than at any time during those six difficult years. His theory can now be tested in open court, following the launch onto the market of three of the most expensive country houses to be offered for sale in south Cheshire for quite some time. Fresh to the market through Jackson- Stops & Staff (01244 328361) and Savills (01244 323232) at a guide price of £5 million, Grade II*-listed Bulkeley Hall at Bulkeley, six miles from the picturesque village of Malpas, is something of a rarity in this rich farming area-a beautifully restored Georgian country house, as opposed to a gentrified farmhouse. The hall’s English Heritage listing incorrectly suggests that the L-shaped ‘mansion’ was built in the mid 18th century around the core of a much earlier house, remnants of which can be seen in bevelled beams on the ground and first floors. However, the datestone on the front elevation confirms that the house was built in 1709 for a member of the Bulkeley family, who were major landowners in Wales and Cheshire, before becoming so mired in debt that their Cheshire estates were ordered to be sold by Act of Parliament in 1756. The manor of Cheadle Bulkeley was bought that same year by the Rev Thomas Egerton, rector of Cheadle, although, thanks to an advantageous marriage, the Bulkeley family later recovered their Welsh lands. Bulkeley Hall then passed through a series of owners, as its lands were gradually sold off. Its fortunes took a definite turn for the better when it was bought by its present owners, who have spared no expense in restoring and upgrading the house and its 9.3 acres of gardens and grounds, with help from interior designer Mark Gillette, who displays a remarkable gift for using the right carefully sourced materials in the right place. Nor have the owners balked at incorporating new elements into the traditional Georgian layout, including the pièce de résistance, an elegant hexagonal drawing room with a stone fireplace and French doors opening onto a paved terrace, with a landscaped walled garden beyond. Another winner is the ultimate Smallbone open-plan kitchen, designed to take advantage of the panoramic views over the lake and the countryside. A revitalised Bulkeley Hall has 7,884sq ft of opulent living space, including four reception rooms, master and three guest suites, four further bedrooms and a family bathroom. Cleverly concealed outdoor amenities include a swimming pool and pool house, stabling and a tennis court. A two-bedroom lodge is available by separate negotiation. 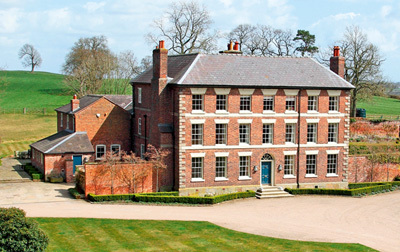 The owners of Grade II-listed Spurstow Hall at Spurstow, four miles from Tarporley (ranked third among Britain’s Top Ten Perfect Villages in 2008), have literally left no stone unturned in restoring the early-19th century former farmhouse, built to replace a timber-framed 17th-century building burnt down in 1757. The hall and its farmstead were then part of the Crewe estate, which had its heyday in the 18th century, and was eventually sold to the Duchy of Lancaster in 1936. 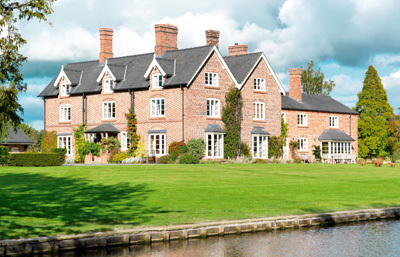 Joint agents Savills (01244 323232) and Wright Manley (01829 731300) quote a guide price of £10m for the main house, with its two-bedroom coach house, massive long barn, stable block, traditional farm buildings, lake, tennis court, kitchen garden and helicopter landing pad, set in 30 acres of undulating parkland that has been liberally planted with young trees. A further 300 acres of adjoining farmland are available by separate negotiation. As befits the standards demanded by a giant of British industry, the renovation of Spurstow Hall, completed in 2006, was planned and executed ‘without compromise’. The hall was stripped back to the bare brickwork and many of the outbuildings totally rebuilt. The entire site has been data-cabled and includes a modern telephone exchange, full wireless coverage and extensive Bang & Olufsen audiovisual distribution as well as firecontrol and security systems. Fortunately, the owner’s wife is endowed with well-honed interior design skills, which go a long way to softening the initial impression of hard-nosed practicality. Here, as at Bulkeley Hall, liberal use has been made of wonderful natural materials, such as the French oak floors in the reception hall and dining room. Essentially, Spurstow Hall-with its four reception rooms, seven bedrooms, five bathrooms, offices, swimming pool, gymnasium and integrated garage-is a house designed for the ultra-energetic who like to work and play hard.